Let's start with my room, shall we? 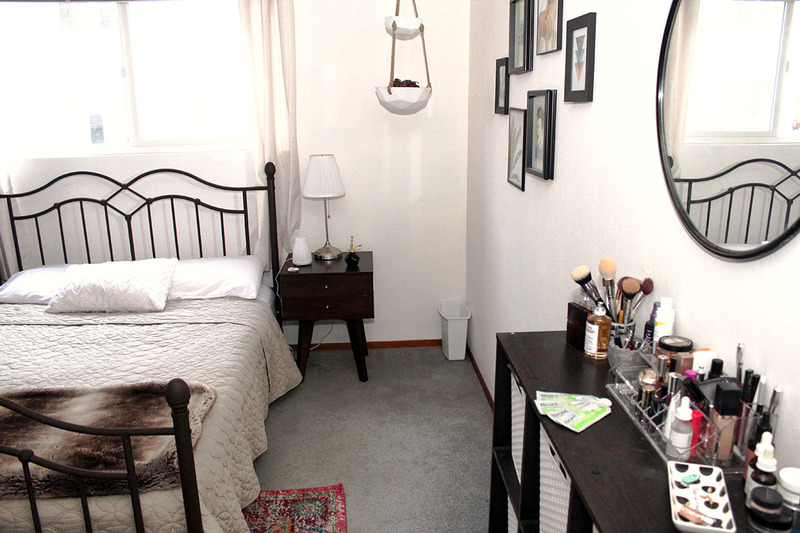 My biggest and best transformation in here is my vanity, which used to just be a bunch of bright blue cardboard drawers stuffed with all kinds of stuff I didn't know what to do with. The top of which, more often than not, was piled with stuff I also didn't know what to do with. Since I work in the beauty industry (and share a bathroom with two other women), it quickly became clear to me that I needed to get organized with my products and make a space that was fun and easy to get ready in. I added a mirror (which I found on the side of the road when I first moved in, I might add) designated a drawer to hair products, one to makeup (each category in a different type of bag, which I also have an abundance of these days), one to nails/cotton balls, one to sunscreen/self-tanning, and a few various drawers dedicated to important files, workout gear, etc. On top of the shelf (is that what you'd call it?) I added a clear makeup organizer where I keep my most-used products for easy access. 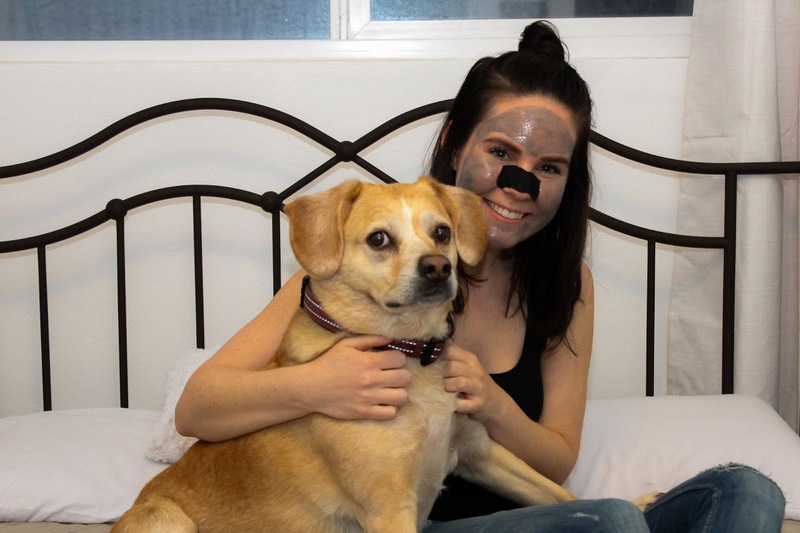 I'd love to chat more about how my skincare routine has evolved over the past year (a post for another day), but for now let's just say I've seriously stepped up my masking game. On any given night my roommates will see me cooking, watching Netflix, or getting ready with multiple masks on my face at once. 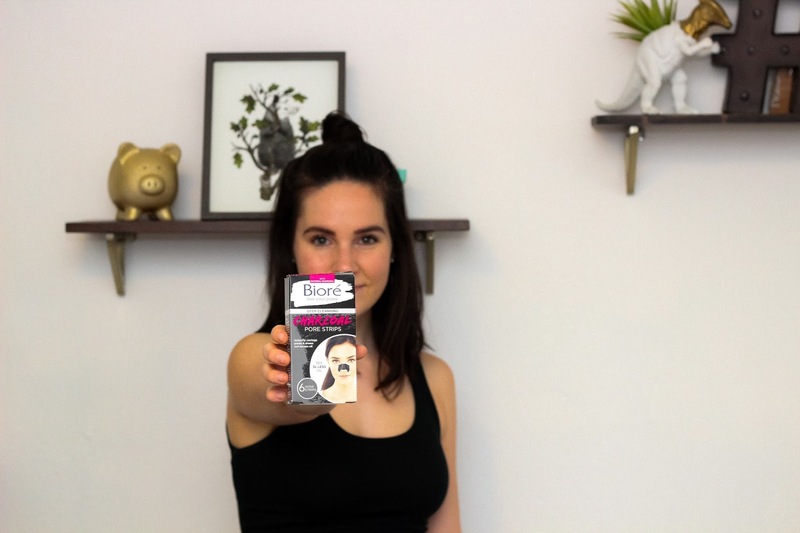 I like to focus the formula on the problem area instead of hoping one mask will rule them all, so I was excited at the opportunity to partner with Bioré. 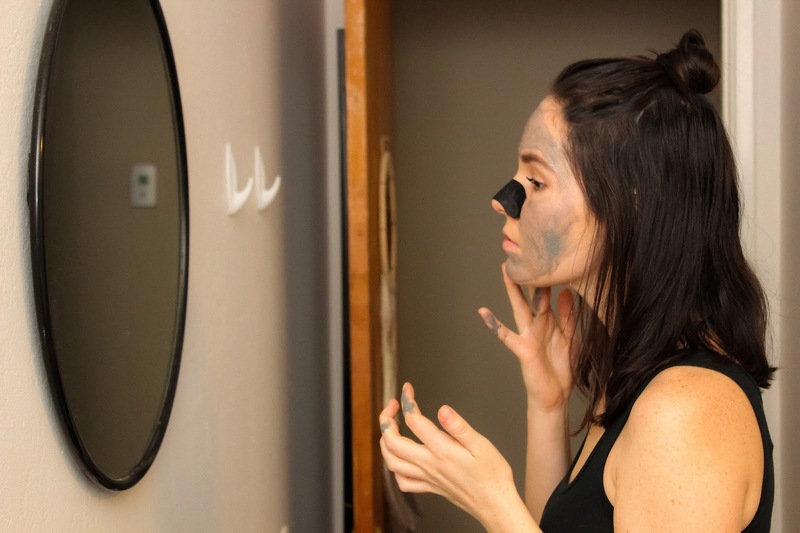 They sent me Deep Cleansing Pore Strips, which use charcoal to draw toxins out of the stubbornly visible pores on your nose (I also drink charcoal in juices, add it to my toothbrush to whiten my teeth, and you'll even find it in my face wash) and the Self Heating One Minute Mask, which is great for oily areas like my T-zone and chin. Next up, my mini gallery wall and sadly now-empty hanging planter. If you'll take a trip through memory lane for a moment, let's remember when I made my own wall art using an old planner I cut images out of and glitter-fied some Fun. lyrics... Oh, and had a mental breakdown because of a curtain rod. Those were good times, but luckily they're over. 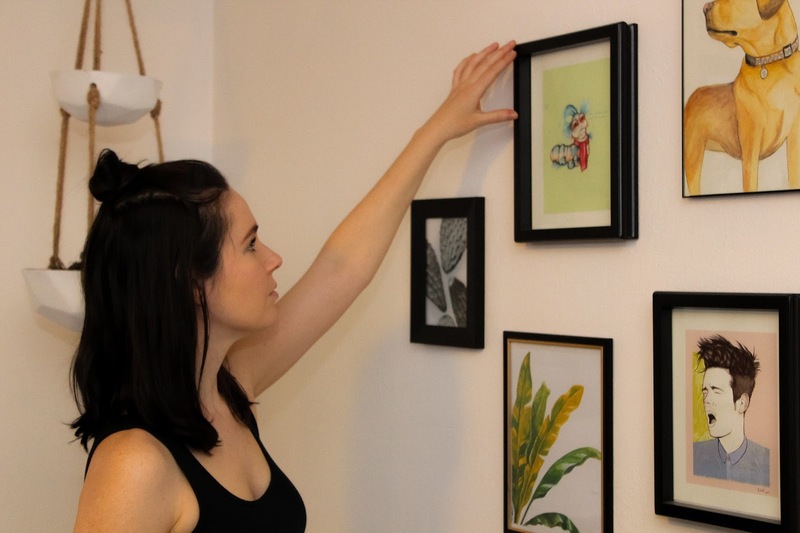 I can now afford picture frames and art prints made by people who do art for a living (I cannot, however, afford a place with my own bathroom anymore, so that's cool). 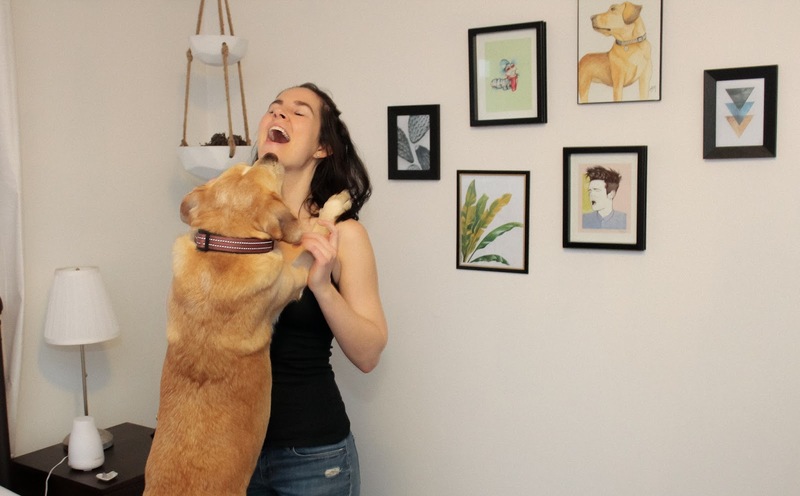 I ordered the Labyrinth and Nate Ruess (I haven't changed THAT much) prints from Society6, the painting of Ziggy I commissioned from Dog Doodlez, and the other two were free print downloads I found on the interwebs. As for the hanging planter, I assure you when I first hung it, it was overflowing with flourishing plants. Then they became super dead, so I threw them out. I already showed you the new bed frame, newly painted bright white walls and curtains (they used to be blinds that made an awful screeching noise every time I pulled them up or down) back in this post, but I'm happy to say that I am now the proud owner of a queen-size mattress that actually fits the frame. How cute are my mid-century style bedside tables? I'm not sure how that cactus is still alive and well since I take even less care of it than the old hanging plants, but I'm not complaining. I also added that ceiling fan (I definitely had help), this rug, some cute shelves with gold hardware, and the same old dresser, except I added jewelry organizers and some hats hanging on the wall. I also got this cute cactus-print laundry basket that stands upright instead of the big, ugly bag that would spill out all over the floor. As for the closet, well, it used to have *hideous* sliding wooden doors that absolutely refused to stay on the tracks and blocked me from seeing half the contents of my closet at all times. So I took them off and replaced them with these eye-print curtains, which has made my life significantly better (they're hiding horizontally at the back of my closet because I'm a thinker). That's about it for now, but I'll be back soon to show you the new additions to the living room and balcony. Thanks to Bioré for sponsoring this post. Be sure to get your own strips & mask on Amazon. Also, a huge thanks to Donny from Toshiro Images for capturing these fun photos! Follow him on Instagram here. Oh man, I am loving your room! 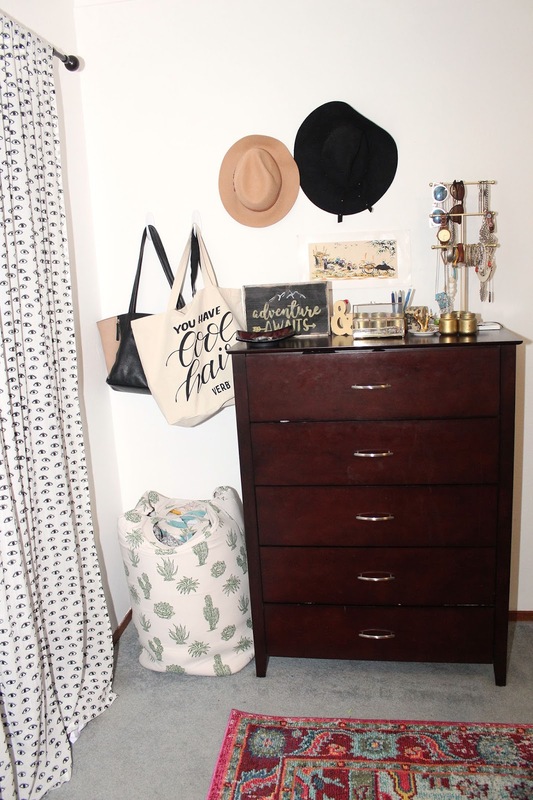 That bed frame is legit and I love your dresser set up with the hats above it! I also love biore products. Especially the nose strips.